Carte de France Pour le Service Du Genie Militaire. An enormous 1870 folding wall map of France drawn, as the title suggests, for 'genie militaire' or 'military intelligence.' Prepared for publication by Dumaine, this map covers from the North Sea to the Mediterranean and from the Atlantic to Italy, thus covering all of France as well as significant portions of the adjacent countries. Dumaine based this chart on cartographic data obtained from the Depot de Guerre. In includes all towns and villages, as well as major roadways, rail lines, orts, and topography by hachure. The country is divided with color coding according to the post 1790 Department system. An inset of Corsica is presented in the lower right quadrant. Julien Dumaine (1843 - 1880) was a French publisher and bookseller active in Paris during the latter half of the 19th century. Most of Dumaine's work was intended primarily for military use and apparently sold quite well, earning him both professional respect and moderate wealth. His apprentice Louis-Lucien Baudoin inherited the Dumaine firm upon the latter's retirement. Julien maintained office at 30, Rue et Passage Dauphine, Paris. 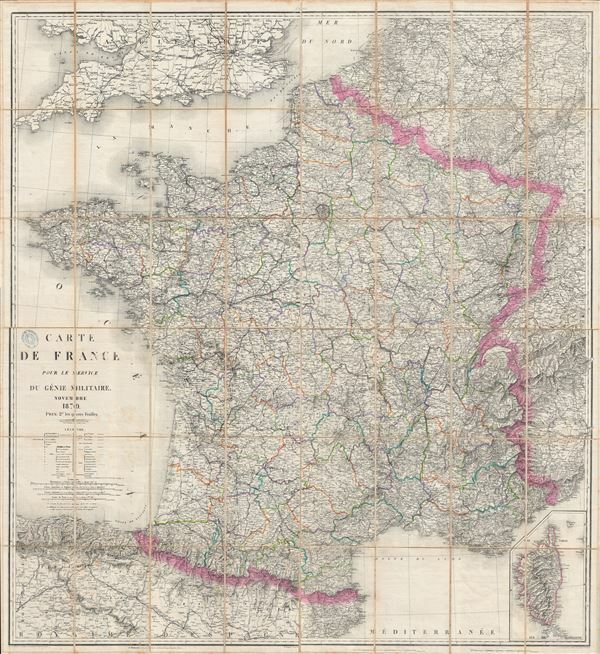 The Depot de Guerre (1688 - 1887) was a branch of the French military devoted to creating, collecting, and publishing military memoirs, plans, and maps. The Depot was founded in 1688 by Francois Michel le Tellier, the Marquis de Louvois. Louvois held the post of Secretary of State for War under Louis XIV and his best known for composing the first letter regarding the mysterious "Man in the Iron Mask". During the French Revolution and the Napoleonic Wars the Depot de Guerre expanded its operations to include any and all topographical research in France. In 1887 the Depot de Guerre was disbanded and its duties split between the Institut Geographique National (IGN) and the Service Historique de L'Armee (SHA). Very good. Light toning. Dissected into sections and backed on linen, as issued. Comes with marbled slip case.